O Brother, Where Art Thou? is one of those films that just slipped through the cracks for me over the years. I remember the soundtrack being a hot commodity — and damn that bluegrass is infectious — but never sat down to watch the entire movie. It’s a shame that it took me twelve years to see this because this is yet another ridiculously fun effort from the Coen brothers. 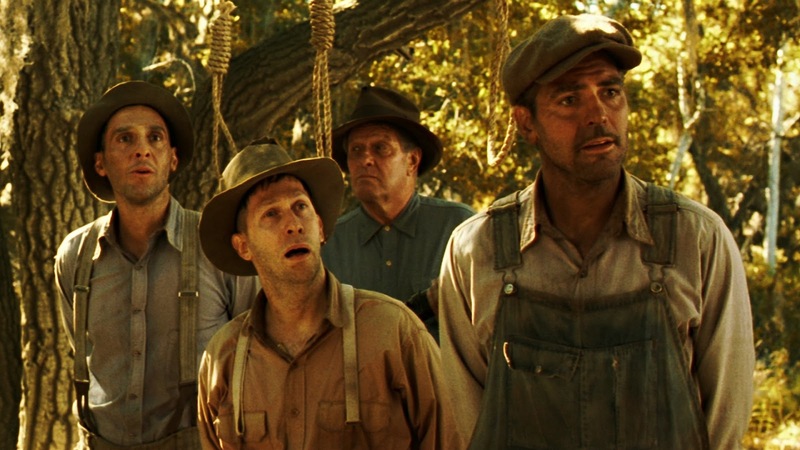 Set in 1930s rural Mississippi and loosely based on Homer’s “The Odyssey”, the film follows the exploits of three escaped convicts who are in search of hidden treasure. The trio, comprised of de facto leader Ulysses Everett McGill (Clooney) and his two pals, Pete Hogwallop (Turturro) and Delmar O’Donnell (Nelson), run into all sorts of trouble on their journey. Not only are they constantly chased by the law, they also have a habit of becoming entangled in other unexpected endeavors. They form a bluegrass group — the Soggy Bottom Boys — with a young black musician named Tommy (Chris Thomas King), and as a result somehow get caught up in a political race as well as a KKK rally. The group also comes across undesirable characters including a trio of “Sirens”, a one-eyed bible thumper (Goodman) and a bipolar bank robber named George Nelson (Michael Badalucco). Oh yeah, and in the middle of this, Ulysses is trying to get back with his estranged wife, Penny (Holly Hunter). It’s a wild ride for sure. 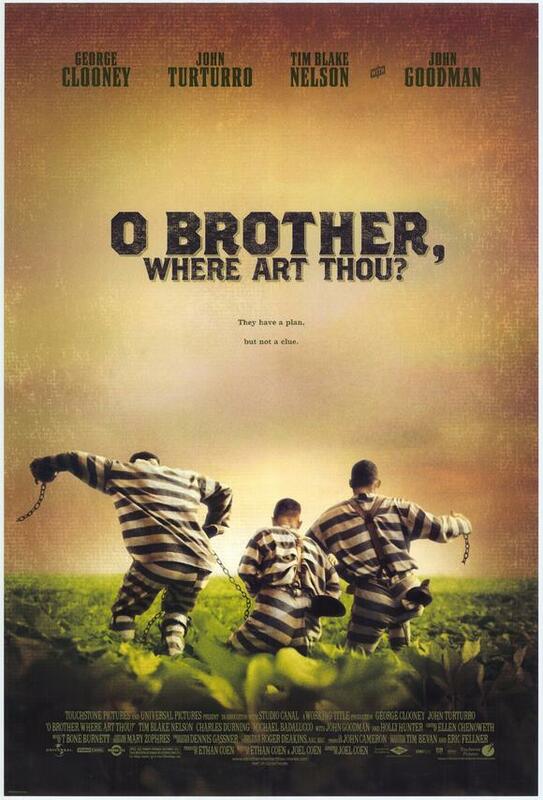 At its core, O Brother, Where Art Thou? is a road movie, and we are there for the entire epic adventure. The aforementioned run-ins with other characters lead to a number of memorable scenes, many of which are so ridiculous that it’s hard not to fall in love with them. Of course, the addictive soundtrack adds even more to the overall film, and even non-bluegrass fans should enjoy the catchy tunes. Even as I sit here writing this review, I have “Man of Constant Sorrow” stuck in my head. That’s a good thing. Clooney, Turturro and Nelson make for an entertaining trio, and they play off each other fantastically. Clooney’s natural charisma makes him the obvious choice for the leader of the group, but I was most impressed with Nelson’s humorous slack-jawed yokel of a performance. The overall cast is amazingly well-rounded, with great takes from Goodman, Hunter and my personal favorite, Stephen Root, who plays a blind radio station manager that gives the Soggy Bottom Boys their big break. While some may find fault in how O Brother, Where Art Thou? sometimes feels like a collection of short films thrown together as one, there’s no denying that this is uproarious fun from beginning to end. 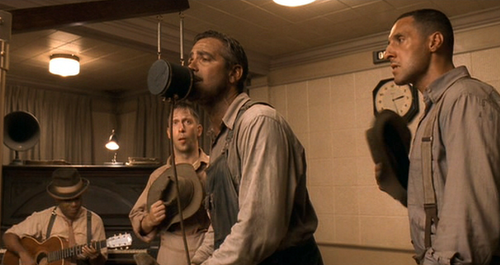 The Coen brothers have a knack for these zany comedies, and the script is full of brilliant, quick-witted dialogue. I had a great time with this film, and I get the feeling that this is one that just gets better with age. I’ve watched this movie many times, and it was one of the first soundtracks I ever bought. Amazing music. It was a high point when I heard a promo for an episode of Supernatural featuring a new version of the song O’ Death. And there’s a great Wizard of Oz homage during that KKK scene. I also remember when it was first coming out that I had heard that the actors were all doing voice training so they could do the singing themselves, although the only one that ended up on the final song was Tim Blake Nelson singing In the Jailhouse Now. Definitely one of my favorite movies. Still one of my favorite Cohen Bros. films. Plus, it’s a great retelling of another best-loved tale of mine, The Odyssey. Well done, Eric. Thanks, Michael. It’s definitely up there for me as well when it comes to the Coens. So much fun. It’s a gem. I think it might be the last of their films that had that air of innocence about it. I’m getting too old to enjoy the bleak humour of things like Burn After Reading – I’d probably have liked it better 20 years ago. I found The Man Who Wasn’t There utterly beautiful though, but didn’t even watch No Country for Old Men. That’s a good point. Their recent output is quite a bit different than films like this or Raising Arizona (which I noticed a lot of similarities between the two). I haven’t seen The Man Who Wasn’t There yet, but I will be pushing it up to the top of my queue now. Glad to hear you enjoyed that one so much. Yeah, I read somewhere that the Coens never actually read the Odyssey — they just based it on pop culture adaptations and references. I thought that was pretty funny. I remember watching this movie during one of my high school classes. I loved it! Nice! Now that’s a great class. Great post, this one seems to have slipped off my radar so thanks for the reminder. Thanks Vinnie. Hope you’re able to see it soon. Great review for a great film, Eric. While I haven’t seen every Coen brothers film yet, this is my favorite out of the ones I have. Thanks, Morgan. There are a few Coen films I need to see as well, but this is definitely up there as one of my favorites so far. If you’re looking for something similar in style, I recommend Raising Arizona. Just saw it for the first time this summer and it was a lot of ridiculous fun. Yeah, I’ve had Raising Arizona on my to-see list for a while. Glad to hear it gets your approval. Really enjoyed this movie, glad you did, too. How did you manage to miss it for so long? Indeed. Same with me and Casablanca, just sort of slipped by. Worth watching, though, really enjoyed it. Great review! I like this film a lot, it’s very quirky and at times I almost feel as if Wes Anderson made it, because of all the vibrant colors and fun music. Clooney was so much fun in this one. Thanks, Sati. That’s a great observation — this film really does have a distinctive style to it. Apparently it was one of the first films to use digital color collection, which I had no idea. I really like this movie and its references to The Odyssey. I like how Clooney’s character cannot live without his Dapper Dan grease. The Dapper Dan stuff killed me. Loved it. Good choice man. This is a Movie everyone should see for sure. Glad you have now! It’s a ton of fun, just overflowing with the Coens quirky humor. You said it, man. Did you already make this a MTESS entry? If you really want to have fun with this movie and if it motivates you enough to do so, I highly recommend checking out Sullivan’s Travels from Preston Sturges, which is where the Coen film got its name. Thanks for the tip, John. I actually haven’t seen anything from Sturges, so I’ll make that my first. Hi Eric, Back from hols and I see you have done a review of probably my favourite Coen Bro film. Oh man I love this soooo much..
We in a tight spot!!! Hi Scott, glad to have ya back! This is a good one, isn’t it?? Hope you had a great holiday!